Definition at line 29 of file CacheTime.php. Return true if this cached output object predates the global or per-article cache invalidation timestamps, or if it comes from an incompatible older version. Definition at line 167 of file CacheTime.php. References $wgCacheEpoch, getCacheExpiry(), getCacheTime(), isCacheable(), and Parser\VERSION. Returns the number of seconds after which this object should expire. 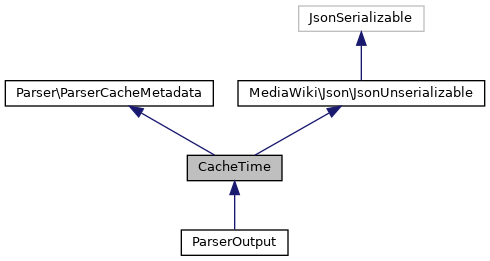 This method is used by ParserCache to determine how long the ParserOutput can be cached. The timestamp of expiry can be calculated by adding getCacheExpiry() to getCacheTime(). The value returned by getCacheExpiry is smaller or equal to the smallest number that was provided to a call of updateCacheExpiry(), and smaller or equal to the value of $wgParserCacheExpireTime. Definition at line 129 of file CacheTime.php. References $mCacheExpiry, $wgParserCacheExpireTime, and null. Referenced by expired(), ParserOutput\hasDynamicContent(), isCacheable(), ParserCache\save(), MediaWiki\Storage\PageEditStash\storeStashValue(), and WikiPage\triggerOpportunisticLinksUpdate(). Definition at line 87 of file CacheTime.php. Definition at line 60 of file CacheTime.php. Referenced by expired(), MediaWiki\Storage\PageEditStash\storeStashValue(), and WikiPage\triggerOpportunisticLinksUpdate(). Definition at line 155 of file CacheTime.php. Referenced by OutputPage\addParserOutputMetadata(), and expired(). Return true if this cached output object is for a different revision of the page. We always return false if $this->getCacheRevisionId() is null; this prevents invalidating the whole parser cache when this change is deployed. Someday that should probably be changed. Definition at line 192 of file CacheTime.php. Definition at line 95 of file CacheTime.php. setCacheTime() sets the timestamp expressing when the page has been rendered. This does not control expiry, see updateCacheExpiry() for that! Definition at line 74 of file CacheTime.php. Sets the number of seconds after which this object should expire. This value is used with the ParserCache. If called with a value greater than the value provided at any previous call, the new call has no effect. The value returned by getCacheExpiry is smaller or equal to the smallest number that was provided as an argument to updateCacheExpiry(). Definition at line 112 of file CacheTime.php. Referenced by ParserOutput\finalizeAdaptiveCacheExpiry(), and ParserOutput\updateRuntimeAdaptiveExpiry(). Seconds after which the object should expire, use 0 for not cacheable. Definition at line 50 of file CacheTime.php. Revision ID that was parsed. Definition at line 55 of file CacheTime.php. TS_MW timestamp when this object was generated, or -1 for not cacheable. Definition at line 44 of file CacheTime.php. ParserOptions which have been taken into account to produce output. Definition at line 33 of file CacheTime.php. Definition at line 38 of file CacheTime.php.